Tajikistan provides the setting of Makhmalbaf’s lyrical fable about a young blind boy and the acute sense of hearing that both connects him to – and liberates him from – the realities around him. Poised as if floating slightly above the earthbound individuals alongside him, the ethereal Korshid seeks attunement to everyday harmonies, though the discords of unemployment, poverty, and fanaticism remain omnipresent. “I am moving away from a political cinema towards a more poetic cinema,” Makhmalbaf declared; Silence finds beauty not in words and discourse, but in sounds, colors, and movement. Mohsen Makhmalbaf and his son, Maysam, travel to Israel to investigate the Baha’i faith, a world religion with around seven million followers which originated in Iran about 170 years ago. Youth from all over the world come to Haifa – the centre of this religion – to serve, and those who serve in the gardens that surround the holy places develop peace-loving attitudes through their interactions with nature. During their investigation, the father and son disagree on the role of religion in today’s world and eventually separate to pursuit their own research. This poetic documentary shows two different views on religion and two generations of Iranians. 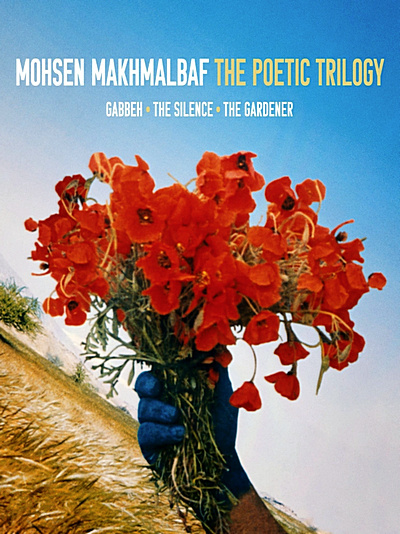 Poetry in Motion: An Interview with Mohsen Makhmalbaf (1080p; 1:00:36) is a well done interview conducted by Jonathan Romney covering Makhmalbaf's career in general while also touching on these films. Mohsen with Closed Eyes (1080i; 16:34) is listed as "an imaginatively filmed archival interview with Makhmalbaf on The Silence", but while the content is definitely interesting, the "imaginatively filmed" part boils down to Makhmalbaf speaking with his eyes closed.